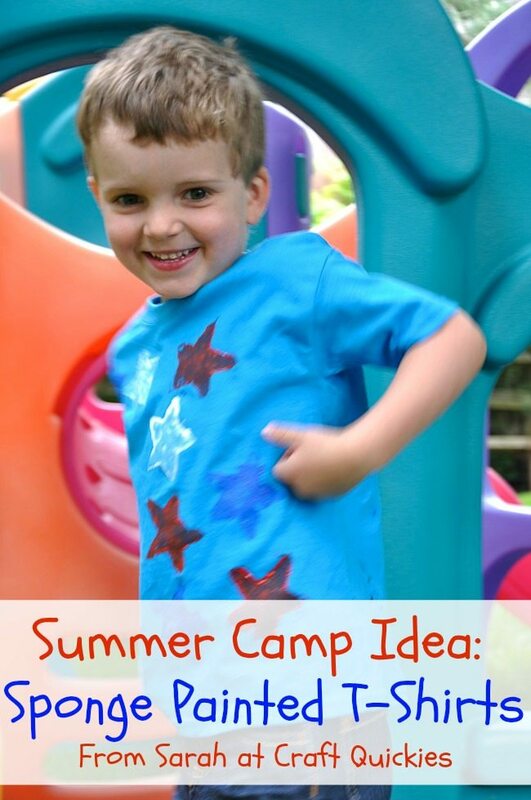 I posted this fun kid craft on the wonderful blog Design Dazzle last month as a guest post in her fabulous Sumer Camp Series. I have seriously Pinned almost ALL of the post onto my Summer Fun Pin Board. If you are interested in all things kid—kid activities, parties, bedroom decor, etc.—then Design Dazzle is a blog that should be on your MUST SEE list! Now on to my project. I used to teach elementary school, and I am now a stay-at-home-mom, so all things kid are near and dear to my heart. I am just a color-loving, picture-book-reading, holiday-celebrating dork at heart. It’s true! However, as you know, I usually blog about recipes and crafts that I do on my own, not with my kids. I have been thinking for some time now that I should be incorporating more kid crafts and learning activities into my blog, so this post was just the kick in the pants that I needed to get started on that goal! Along with sponge painting her walls, she also had us sponge paint our own t-shirts, wrapping paper, and other things. 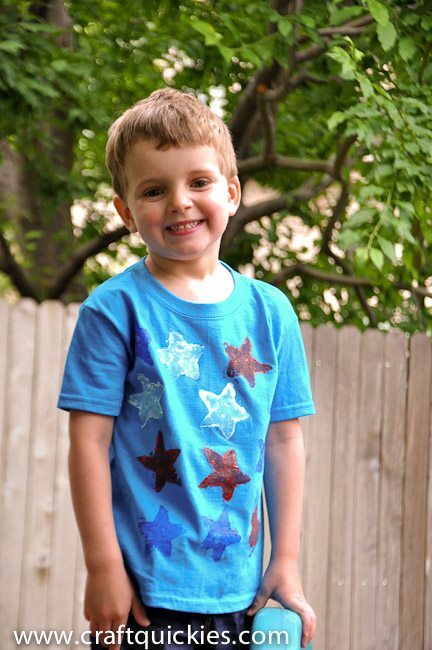 I always loved doing that when I was little, so I decided to do some sponge-painting with my little boy so that he could design his own Fourth of July t-shirt for our neighborhood parade. My dad saw it drying and said, “Ummm…..I think you might be losing your touch, girl…” Gee, thanks, Dad! The FOUR YEAR OLD did it! Haha. The beauty of this activity is that you can do it with any shape or design that you want! Now let’s get going on some FUN! For this activity you will need a plain t-shirt (I usually find them cheap at Walmart or Hobby Lobby), fabric paint, and plain sponges, cut into any shape that you would like. I also suggest putting something in between the two layers of the t-shirts, such as foil, wax paper, or cardboard. Otherwise the paint may soak through and glue the back and front of the shirt together. Not that I know that from experience or anything….. 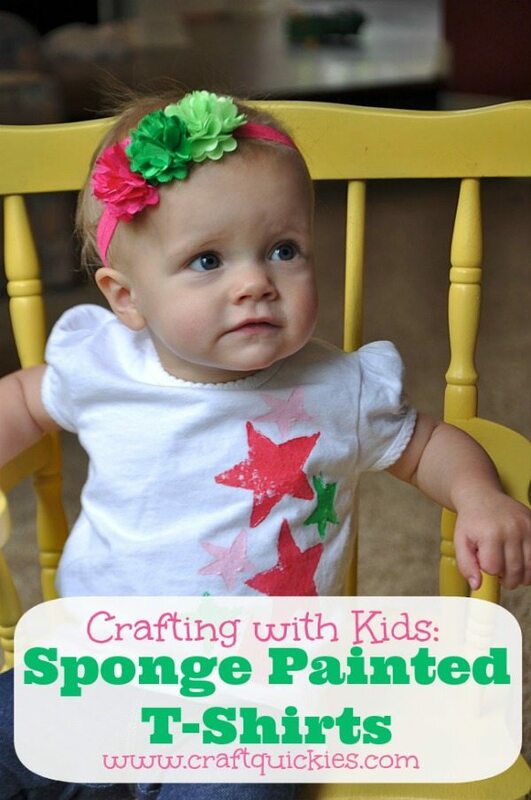 Put an apron on your little one and get ready to paint! Simply dip the sponge into the paint and press it onto the shirt! Try not to tell them where to paint, Mom. I know it’s hard, BELIEVE ME, but it doesn’t really matter what their t-shirt looks like, and they have so much fun being “in charge” of their own art project! Now let that shirt dry! Ta-da! So proud of his artistic handiwork. I just love him. He wore his shirt oh-so-proudly at the Fourth of July picnic for our church and at our family BBQ. While he was working I made a shirt for his sister, so that we were crafting together. She is my sweet girl. *This post was originally posted on Design Dazzle.